The lights dimmed, the band took its place, and applause ricocheted around the World Cafe Live in Philadelphia as if the staccato rhythm humming from an old-fashioned movie projector. The silhouette of a shapely dame clad in a fedora hat and sporting a cane sauntered to center stage while the seductive notes of the night’s first song drifted through the room. I’d briefly investigated the singer, Melody Gardot, the year before when her name popped up during a routine background check of another chanteuse, one Peggy Lee. There, at the bottom of the Amazon page for one of Lee’s many albums, on the “Customers Who Bought This Item Also Bought” list, was Worrisome Heart by Melody Gardot. I’ve discovered a fair bit of good music that way, so clicked on the link to check it out. Back to the show in question: Diane and I were seated near the bar, where the constant clank-clank-clank of glasses and dishes being washed and sometimes dropped, not to mention the constant murmurs of folks ordering drinks, can occasionally distract one from the music. Not this night, however. A little more than a month before, she’d released My One and Only Thrill. It’s an excellent set of what’s called jazz-pop (as silly a label that I’ve come across), though to my ears it’s more a melding of the jazz and singer-songwriter genres. It’s the home to the above “Baby, I’m a Fool” and “Your Heart Is as Black as Night,” as well as several of the night’s other standout songs. And this performance of Bill Withers’ “Ain’t No Sunshine,” from Amsterdam the year before, ably captures the same smoky mood and lighting. To say we were enthralled would be an understatement. We saw her two more times over the next year, with each show equally mesmerizing. 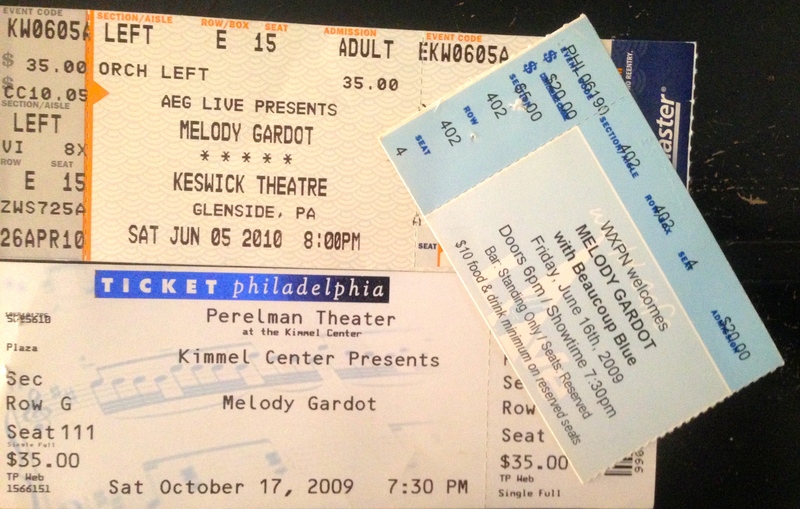 Four months later, at the Kimmel Center’s Perelman Theater in October 2009, the band was tighter and music more fluid. During “The Rain,” she reached into the piano and plucked its strings – something I’d never seen, and have only witnessed once since – at the Keswick Theatre in the Philly suburb of Glenside, when Melody played there in June of the following year.